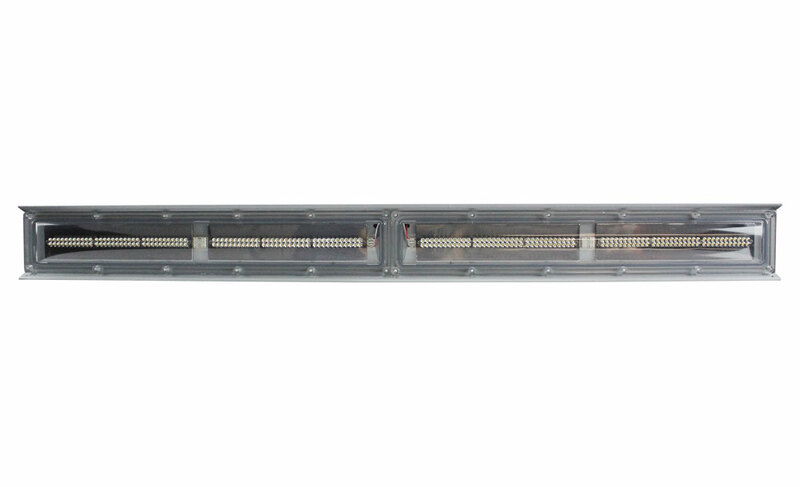 The Larson Electronics EPLC2-48-100LED-AMB Adjustable Mangetic Mount Explosion Proof LED Light Fixture is U.S./Canada UL Listed Class 2 Divisions 1 & 2 for areas where combustible dusts exist or have the potential to exist. This explosion proof LED light has a T5 temperature rating and is designed for low profile pendant mounting to make the maximum use of available space. The EPLC2-48-100LED-AMB is comprised of solid state design LEDs, making this explosion proof led fixture highly resistant to shock and vibrations and cooler running than comparable incandescent and HID light fixtures. This 78 Watt LED fixture draws less than one amp on a 120 Volt AC power system while producing 7,250 lumens of bright white light, producing efficiency that reduces power consumption and operating costs without compromising light output or quality. This light is multi-voltage capable and can be operated with 100-277 VAC, 50/60Hz without any need for a special ballast. The housing is specially designed to dissipate heat which increases the efficiency and lifespan of the LED luminaries. The LED lamp produces 7,250 lumens with a color temperature of 5000K and a color rendering index of 70, which produces colors and details much more accurately than high pressure sodium or mercury vapor luminaries. The EPLC2-48-100LED-AMB mounts via two adjustable legs equipped with magnetic feet. This magnetic mount explosion proof light features two adjustable swivel brackets constructed of aluminum. Each aluminum mounting bracket features a 200 lbs grip magnet, which provides a total of 400 lbs of grip and allows operators to mount the unit to ceilings, walls, and any flat ferrous surfaces. The wiring of this portable hazardous location lighting system consists of 10 feet of SOOW cable and is terminated in a 15 amp explosion proof plug. 10. Provides temporary illumination and easy of mobility between or within job sites. 1. 100,000 hour lifespan.